It was in Peter’s kitchen that my eyes opened. A spring day in 2006, I visited Peter in the Auckland suburbs to brew a plan of making Captain Cook’s Manuka Beer (the story was that they improvised with local ingredients after surviving a long journey from England). 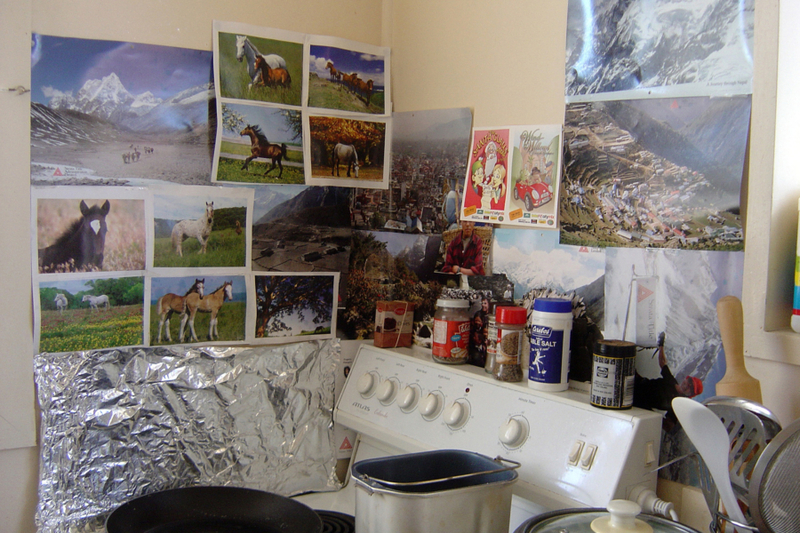 In his rented flat, beside the cooking stove, I saw vistas of alpine prairies and galloping horses. ‘They are old calendar pages–to stop the oil splatters on the wall’, he said with a shrug. Practical, but also beautiful, to my eyes. At the time I had been struggling with the accumulating stuff–a.k.a. future art materials in my flat. After one year of attending art-school, I had started to appreciate the material potential of ‘junk’. Thus, rusty bits from the side of the road became ‘wabi-sabi’ objects. Accumulation comes with the burden of chaos. How do I take care of them? I sought help from the professionals: books on ‘storage’, ‘living with collections’ and ‘interior design’. Flicking through glossy photos of New York lofts and Parisian apartments, I wondered: How come none of the solutions related to me? When could I have a consultation with a designer to work out the best solution for my possessions? Wandering became more like treasure-hunting, an adventure where I never knew what I might find, like the Situationists’ dérive and the walks of Architectural Detective Agency and ROJO society. Unlike going through a book, gallery or shop, where things have been displayed for attention, I had to look for them. With that, comes a certain pleasure – the delights of discovering things which bring a smile for myself. Over time, I’ve learnt to tune my awareness, to spot things in the corners of my eyes, or follow a feeling down a small alley. On the rare occasions where I was lucky to have met the makers and caretakers, they often said, ‘This is nothing special.’ These are humble, honest objects made out of particular situations. They had not been ‘designed’ for mass production nor economic exchange. They show traces of material conversations between the beings who relate with them and their surroundings. There is something alive about them. Archipov’s ‘Home-Made: Russian Folk Artefacts’ has been a companion for me from the start, with stories of making from the Soviet era where the shop shelves were empty. Funnily, one can still discover similar quirky things in the present day, when the shops are bustling with cheap stuff. What stories do they tell? 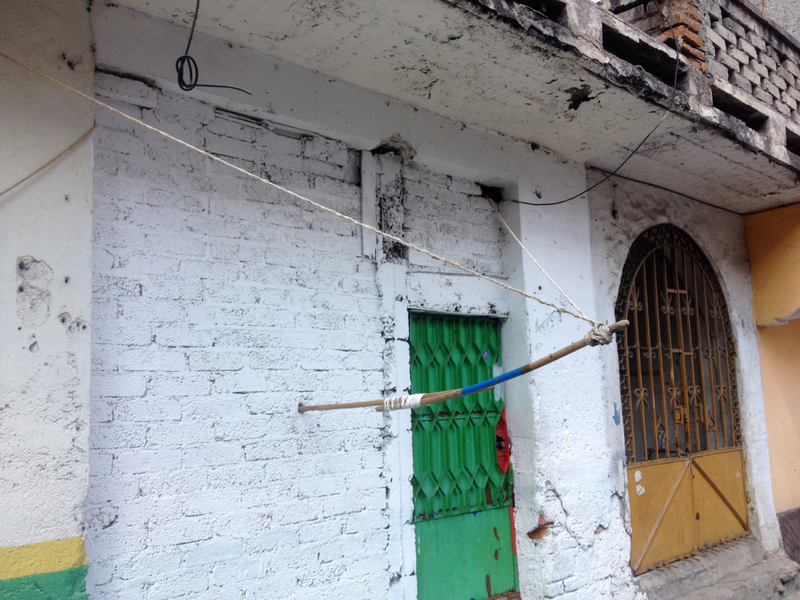 In Yiwu, a town in China that supplies the world’s $2 shops, after being overwhelmed by the cornucopia of mass-produced, brand new consumables in endless labyrinths, I stumbled onto the street, and smiled: an umbrella tied to a pole on top of a mobile oven for sweet potatoes. On Codfish Island, a nature reserve in southern New Zealand, where I volunteered one summer, a scientist showed me a ‘burrowscope’ for observing seabird burrow nests, which involved taped-together-washing-machine-tubes joining a camera and a monitor. In the mountains of Norway, I met a woman drinking tea from a spoonbowl–a spoon with a cavity large enough to be a bowl. It did not have a flat bottom because it was made for sitting on grass. ‘it’s made by a man in that valley!’ she told me, pointing down. ‘The wood looks knotty because it is from gall of trees–the hardest timber resulting from a viral infection.’ Further up the mountain path, we came across a wooden box with a lid of slate, hinged with old electrical wire, holding a visitors’ book. In a community garden in Geneva, growing in-between the plants, were old broom sticks and bent pieces of metal and wire, for holding old butter knives and other digging tools. In roadside Cambodia, I biked past furniture made from spare wooden parts, and ingenious repairs of plastic chairs. They resembled Enzo Mari’s Autoprogettazione, Max Lamb’s Rough and Ready and Martino Gamper’s ‘100 chairs in 100 days’, but how are they different? How could I carry two watermelons on a basket-less bike? In countryside Cambodia, I was humbled by the almost ‘thoughtless’ ease and elegance that the local fruit guy improvised a jig to solve this problem – using two sticks from the side of the road and some bike inner tubes. As if the world is a Meccanno set, without standardised units, but many varied elements which could be joined and transformed into multiple adaptations. 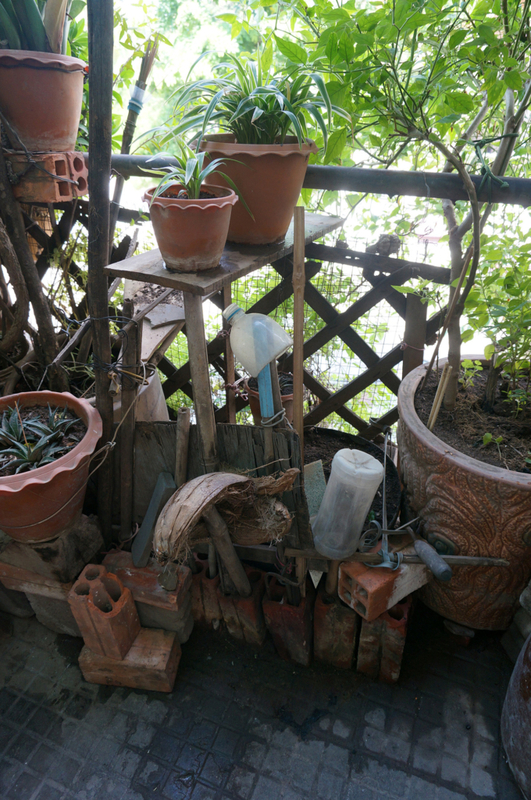 How there are many different ways of making shelves against a wall: folding out from the wall, perching out of balcony fence supported by sticks poking out of broken bricks, or most elegantly: two looped bike chains, each with a screw to the wall, holding a plank in-between. This I learnt from a man who lives in a 16m2 apartment in Kobarid. 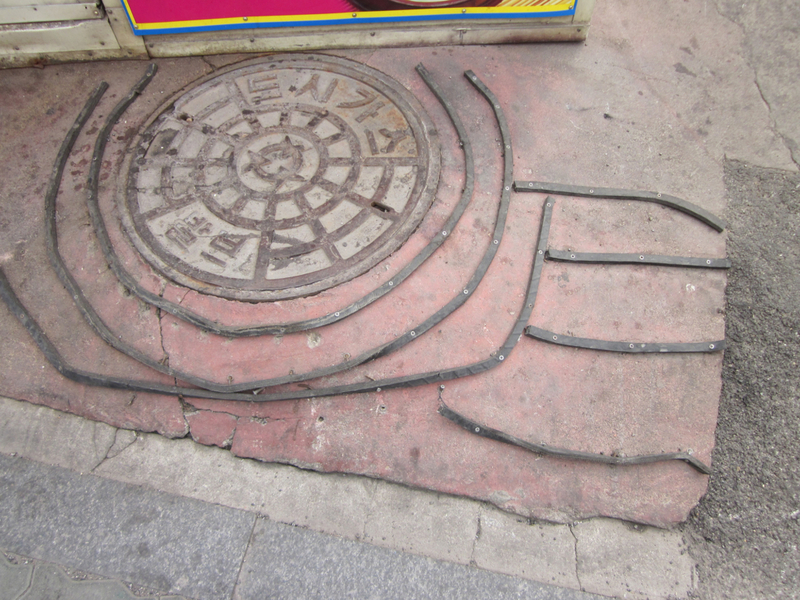 I learnt in a street corner breakfast place in Taipei, how a kitchen extension is ‘typhoon-proof’ by its virtue of being ‘collapsible’, and they had been in the same corner for twenty five years. Temporary construction is a permanent phenomenon. 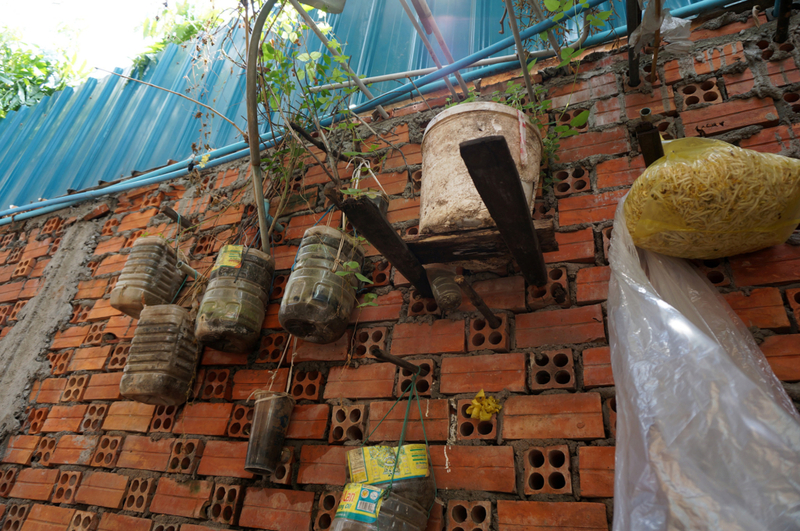 I saw from a man who salvages old ladders from his workplace in Tainan, that a porous conglomerate of material structure in a parking lot could be for many creatures to enjoy: humans, cucumber plants, orchids, geckos, insects, worms, and offer multiple sensory modes of interaction. I discovered down a small path in a mountain behind Kobe, that a fence for a potato garden could be woven out of scraps of fabric and sticks, and offer shelter for weary nomads. What is the difference between clothing and architecture? How some structures weave, grow and change, like the plants and creatures surrounding them. 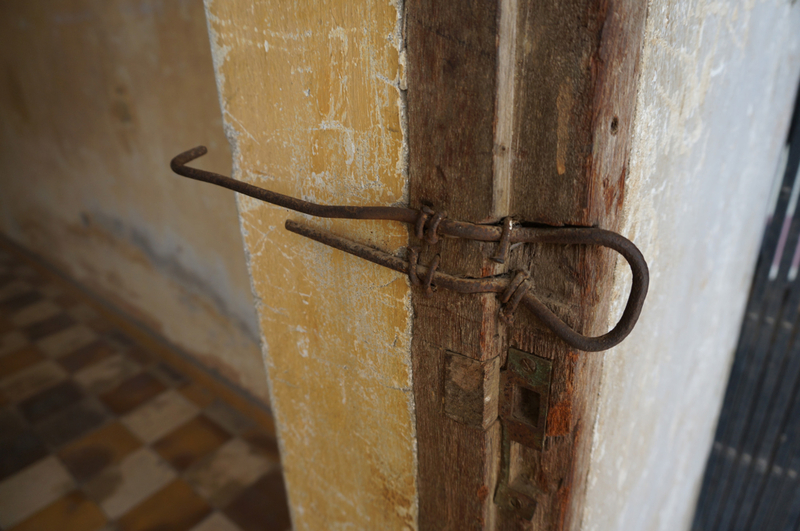 While I take delight and smile with most, I have also come across stories which made my heart shiver: in Phnom Penh, at S22, a former school turned into a prison and torture complex during the Khmer Rouge, I saw door locks made of bent pieces of metal. Forty-minute ride away, in the Killing Fields, the audio guide told stories of how the barbels of the palm trees in front of me, were once used to slit throats. In the same museum, I also saw sandals made out of tyres, as the KR were into self-sustainability. I have been told they are very durable, but few people could bare to wear them nowadays… Those were slaps in my face of fascination and enchantment: This way of making, like all technology, has no inherent ethic of its own. A knife could be used to prepare nourishing food and to harm lives. It is up to the living beings who interact with the technology as to how it is used, and for what purposes and values it serves. Through an internet search for ‘Tokyo tyre park’, I encountered Chris Berthelsen, who had been walking around Tokyo and Nagoya, documenting and blogging the non-intentional landscapes made by non-specialists. On our first meeting, he brought laminated cards of his photos. What can we do with them? We started with a Games Afternoon at RM, asking people to invent games to play and stories to imagine. Since then, I have been carrying these cards with me, showing people. Like mirrors, they reflect various values, judgements, aesthetic standards, points of view and ways of being. In an island art and creativity festival off Stockholm, an IT professor told me: ‘When the aesthetic standard has been lifted from a community, people feel the freedom to make mistakes, to try out things, without the fear of being ridiculed.’ I later realised that he was talking about hackerspaces. In a hackerspace in Mexico city, we discovered “The brain is not a computer”, and the urban environment is only as it is, because it has been maintained to be so. In a makerspace in Seoul, an artist reflected: ‘Even though they are from different places, there is something universal about them. In a design school in Hamburg, there were comments about ‘poverty’ and ingenuity. In an art and technology center in Gwangju, a designer wondered: Who is in need of this material know-how? In an open-source economy gathering in Berlin, a woman told stories of her grandparents in the countryside, how only 50 years ago these practices of repair and fixes were very common in people’s lives. Sometimes, later, I would receive pictures of other people’s own discoveries. What story would have that design solution told? Over the years my hard-drive also became littered with photos of small modifications and handmade joining ways. What about these which fascinate me so much? Which stories kept me returning? For me, the meaning of everyday resourcefulness lies in not putting up with or passively accepting the ‘less-than-ideal’ situation one finds oneself in. Instead, one practices ‘the courage to think for oneself’, and looks for where one can do something – finding and burrowing out creases in the given situation, exercising the agency to make, modify, tweak, improvise with what is around – so it suits one’s actual and unique needs, desires, preferences. It involves doing things properly, which means: according to one’s own standards of perfection, independent of what the rest says is ‘beautiful’. These creations have a direct and intimate relationship with their surroundings, and grew out of their specific situations, and are open to ongoing small modifications, day by day. In a world becoming crowded with same-same shopping malls of shiny, smooth surfaces and black-boxed, impermeably designed products (either considered to be ‘useable’ or ‘waste’), made under alienated labour and extractive industries, these encounters of everyday resourceful making have opened up my imagination to other ways to relating with our material surroundings. Here, the lines between ‘waste’ and ‘resource’ is a matter of perspective. A ‘user’ is also a ‘hacker’ is also a ‘carer’ is also a ‘repairer’ is also a ‘re-designer’. Nothing is ever finished, we are all participants in the ongoing processes of transforming, mixing, blending and recombining, with our material and ecological surroundings. These creations show traces of making–a material conversation, where one ‘follows the lead of the material’, exploring and improvising with the potential afforded by it (T. Ingold ‘Toward an ecology of materials,’ Annual Review of Anthropology 41 (2012): 427-442). -It’s an old sieve. A young voice shouted. Yes, it could be an old sieve. What else could it be? A pause of pondering entered the room. -A holder for flowers? A musical instrument? The helmet of a robot? 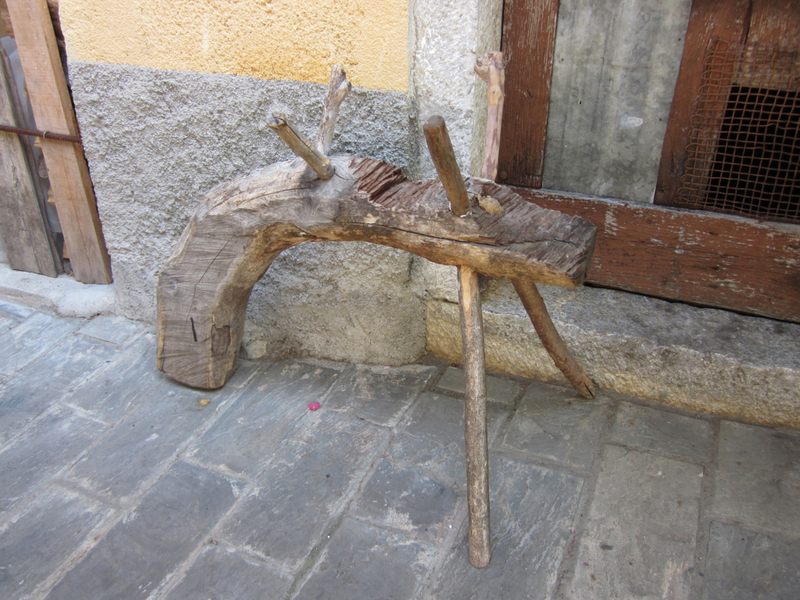 What have I learnt from these creations of everyday resourcefulness? As Atelier Bow-Wow wrote in ‘Made in Tokyo’, seeing is a kind of power. These instances of everyday resourcefulness altered the way I see my material surroundings–with a sense of humour and possibilities. In a world of colonising monoculture, by looking down the creases, I have discovered hope that ‘unbounded variation still exists’ (Editorial, White Fungus, v13, 2013).